We all like to think we’re right in our beliefs, whether it be about God, politics or how our football team can play better. The interesting thing is how strongly we can disagree. A while back I came across an old newspaper column by an atheist, titled The five best reasons not to believe in God, a clever title because it implies that the author has many other reasons not to believe, but he’s just giving us the best ones. So I was interested to check it out to see how good the best reasons were. 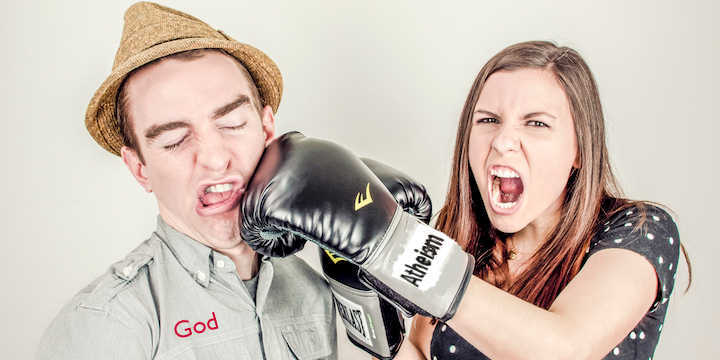 Is it really God 0 – atheism 5? It turns out he slips a sixth reason into his introduction, so I’d better look at this one too. He doesn’t expand on this simple statement, but we all know what he’s referring to – religion leads to wars, terrorism, fundamentalism, bigotry, persecution, etc, doesn’t it? Well, there’s no denying that religious people have done some appalling things, sometimes because of their religion, and sometimes just because they were people who chose to do appalling things. But the question is, do religious people do more appalling things than non-religious people? Religion isn’t the main cause of wars. Several comprehensive research studies show that only about 10% of wars have religion as a major cause – most wars are caused by political issues and perceived injustice. And it appears that more people have been killed by wars started by atheistic regimes than by religious regimes. Neither is religion the main cause of terrorism, despite religious terrorism increasing in the last decade. Religion may provide support for terrorism, but the main causes are generally political or personal. Studies show that, on average, religious people are more socially responsible than others, and exhibit less socially destructive behaviours. It seems that any ideology, be it religious, anti-religious or secular, can motivate people to greater levels of both good and evil. Governments intent on doing evil can use religion, or a secular ideology, to promote their agendas. So we’d have to conclude that religion doesn’t always do as well as it ought to do (to its shame), but that it is no more likely to lead people to do appalling things than any other ideology, and has many positives too (see #5 below). The only type of “evidence” he addresses is personal experience, which he dismisses as “anecdotal” and worthless because it “can’t be repeated under test conditions”. I think the author confuses “evidence” and “proof”. Very few things can be proven. Most science is established within confidence limits (i.e. it is probably true) and is always subject to change as further information is received. Other, often more important, aspects of life, such as right and wrong, politics, relationships and worldview, are matters of judgment, and can at best only be established as most likely. So his final statement of fact is not really a fact at all. It is his opinion, no doubt deeply felt, but still opinion, and it cannot be proven. If he wants to call it a fact, he has to offer compelling evidence, which he doesn’t do. As it is, I disagree with him. That is my opinion. Neither of our opinions are facts. But we can test each of our contrary opinions by asking, which view, atheism or theism, explains more of the world? Which one best fits with what we know about the universe and life? Which best explains the evidence we have? There is a lot of what I think is evidence for God that he doesn’t discuss. And it is evidence that seems to me to be hard to explain if atheism is true, and easier to explain if theism is true. Without a God, I have never seen a convincing explanation for how a whole universe could come into existence with all its parameters set within fine limits to allow stars, planets and life to form. (Existing from eternity is even harder to believe, especially as an infinitely old universe would have infinitely run down by now.) But creation by God explains it well. If naturalism is true (i.e. no supernatural God), humans are just smart animals, without freewill, with no objective ethics, with our thinking determined by our brain chemistry rather than by logic, and with no explanation for our conscious self. Yet we experience all these things. Atheism can’t put our experience and our science together, but theism can. The author writes off human experience as “anecdotal”, but what we experience is the only thing we know. If our experience is false, then we can know nothing with any certainty, including science. Atheism has to explain apparent miraculous healings, visions, mystical experience and conversions in psychological terms, making the claim that every last one of the millions of people who report such experiences are delusional, or at least mistaken. Theism takes the experiences seriously, even if we decide that many are not genuine. The broad sweep of the life and teachings of Jesus are well established by historians, although of course there are plenty of disagreements about the details. In many respects he was a unique individual, the only person who has ever lived who claimed (subtly, to be sure) to be divine, and has convinced millions of people of the truth of his claims. By far the simplest explanation for this historical phenomenon is that he was indeed divine. The lack of a plausible alternative explanation is perhaps illustrated by the movement among some atheists to claim, against the evidence, that he was a myth. Of course every one of these claims has been contested, and the argument continues. But our author doesn’t even mention most of them. The arguments show that christian theism has good explanations for many facts that atheism struggles to explain, meaning that christian theism is objectively at least plausible, and cannot be so easily dismissed or ignored. This is really an extension of #1. He mentions that there are arguments that attempt to show that God exists, but he’s not impressed by them, though he accepts he cannot knock them all down. We at least agree on one thing – we can’t prove that God exists. But like I said before, we can’t prove very much in life at all. However we make important decisions all the time based on what is most likely to be true, even if not certainly proven. So why would anyone choose a less likely option over the most likely option? It seems to me that he has set up his criteria in such a way that makes it impossible for him to believe. Even if God appeared to him, he could argue (as Richard Dawkins has suggested) that hallucination or delusion would be a more likely explanation than that God actually appeared to him. It seems he has made it virtually impossible for God to convince him unless God took away his free will. I actually agree with him on this one. I agree that the suffering in the world is terrible and inexplicable in a world that a good God created. I cannot explain why it is allowed to happen, though I can see that the gift of free will explains why some suffering is inevitable. So if this was the only evidence we had, I would agree that this is sufficient reason to doubt that God exists. But it is not the only evidence we have. I think the evidence I briefly outlined under #1 presents many unanswered questions for the atheist, whereas suffering presents just one unanswerable question for the christian. Furthermore, suffering is only a moral issue if moral statements are objectively true. But I have never seen how atheism can provide an objectively true morality. So the suffering we see around us is a major problem for theists, but if used as an argument by atheists, it seems like it is based on a logical contradiction. He recognises that this isn’t actually a reason not to believe. But he says God isn’t necessary to show us right and wrong or explain mysteries, nor to give comfort and meaning – for most of us at least. Clearly we can live life without God. But he doesn’t explain logically how he knows right and wrong, explains mysteries or finds comfort and meaning. It is interesting that he demands proof for God, but not for any of these important aspects of life. “Religion is about control and limitation”, he says, so we have more freedom if we are not bound by religious rules. And we have freedom from the nasty aspects of religion such as “suicide bombings, torture, genocide, forced marriages, unwanted babies, war”, etc. There is truth in what he says here. For many, religion is a burden too heavy to bear. Jesus actually said the same. But he doesn’t address the possibility that the problem is with bad religion rather than with God. That is my view. I think most religions misrepresent God. I believe in Jesus but I think many, perhaps most, churches don’t well represent him and his teachings. It is a crying shame that religion portrays God so badly, but that is no reason to disbelieve in the God that Jesus revealed. many studies have shown that religions belief and practice tends to lead to many life benefits – longevity; physical, mental and emotional health; peace of mind; meaning and social connection. So he asks for “proof”, but doesn’t seem to be aware of the scientific evidence that indicates he is mistaken on this point. Life is actually better, on a whole lot of measures, with God. Like I said at the start, it is interesting how people can come to such polarised conclusions on the same questions. But I feel we can objectively, based on scientific evidence, reject several of his arguments, and they become positives for God rather than reasons not to believe. And other of his arguments seem to lead to the conclusion that God is at least a better explanation than atheism. Only the problem of suffering seems to work in his favour. I think the score might something more like God 4 – atheism 1. It may not be the proof he wants, but it is a good bet!